Stride, C.B. 'Around the World in Ten Football Statues'. Talk for the Australian Society for Sport History, Sydney, March 2019. Stride, C.B. 'The Bronze Ceiling: Is there gender bias in sports statues?'. British Society of Sports History Annual Conference, University of Westminster, September 2018. Download Slides. Stride, C.B. 'Emperors, thinkers, celebrities, and father figures: the history of football management told through its statues'. International Football Conference, Manchester, June 2018. Stride, C.B. 'Warriors, Teamwork and ‘Football Diplomacy’: How China’s Football Statues Symbolise a Developing Football Culture'. 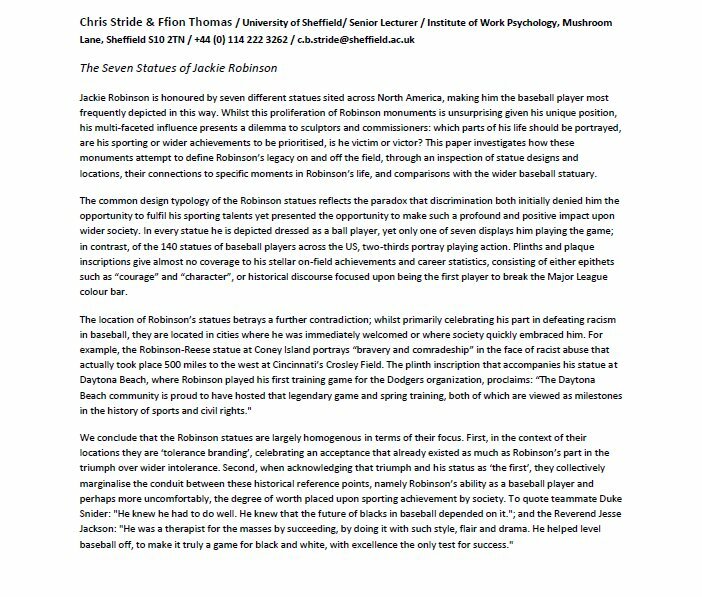 British Society of Sports History Annual Conference, University of Worcester, September 2017. Download Slides. Stride, C.B. 'Around the World in Eight Football Statues'. Off the Shelf Literary Festival, Sheffield, 2017. Stride, C.B. 'Football culture as sculpture: an analysis of the world’s soccer statues'. The Beautiful Game: The Poetics and Aesthetics of Soccer in Transnational Perspective Conference, University of Basel, June 2016. Download Slides. Stride, C.B. 'Immortalising Football’s Fallen: The Statues of Antonio Puerta and Dragan Mance'. Football Culture and Fiction 2014 Conference, MMU, Manchester, 7 November 2014. Download Slides. Stride, C.B., Thomas, F.E. and Chamorro, A. 'Commemorating Tragic Heroes: Statuary of Footballers Who Died Mid-Career'. Soccer as the Beautiful Game: Football's Artistry, Identity & Politics Conference, HOFSTRA University, New York, April 2014. Download Abstract. Thomas, F.E. and Stride, C.B. 'A Story of English Football in Seven Statues'. Football 150 Conference, National Football Museum, Manchester, September 2013. Download Abstract. Download Slides. Stride, C.B. and Thomas, F.E. 'Standing out from the crowd: imaging supporters through sculpture'. NASSH Annual Conference 2013, Halifax, Nova Scotia, 24-27 May, 2013. Download Abstract. Download Slides. Stride, C.B. and Thomas, F.E. 'Tension in the union of art and baseball: competition for ownership of the baseball statuary and its influence upon location and design'. NINE Spring Training Conference on Baseball Research, Phoenix, Arizona, March 2013. Download Abstract.Download Slides. Thomas, F.E. and Stride, C.B. 'The Thierry Henry statue: a hollow icon'.Fields Of Vision - an International Conference of the Arts in Sport. Leeds, November 2012. Download Abstract.Download Slides. Stride, C.B. and Thomas, F.E. 'Honouring heroes by branding in bronze'. British Society for Sports History: Sport and Leisure History Seminar Series. Bloomsbury Room (Room 35), Senate House, University College, London., 22nd October 2012, 5.15pm. Download Abstract. Download Slides. Listen to podcast. Thomas, F.E. 'Football statues: honouring heroes by branding in bronze'. Design History Society Annual Conference: The Material Culture of Sport. Brighton, 14th September 2012. Download Abstract. Stride, C.B. '"You don't build statues to fleeting love affairs": preserving and mythologizing the UK’s sporting heroes'. Design History Society Annual Conference: The Material Culture of Sport. Brighton, 14th September 2012. Download Abstract. Download Slides. Stride, C.B. 'Honouring heroes by branding in bronze'. 'Pay and Play' Conference III: Perspectives on the Sport, Leisure and Creative Industries in the 20th Century. Aberystwyth University, 4th September 2012. Stride, C.B. and Thomas, F.E. 'The seven statues of Jackie Robinson'. NASSH Annual Conference 2012. San Francisco, 1st-4th June 2012. Download Abstract. Download Slides. Stride, C.B. and Thomas, F.E. 'Sporting Statues in the City: Honouring Heroes or Civic Branding?'. Sports and the City: Competition, Cultures, Identities and Urban Life since 1880. University of Westminster, 25th April 2012. Download Abstract. Download Slides. Stride, C.B. and Thomas, F.E. 'How to get from pitch to plinth: the statistics of stadium statues'. Invited talk to Leeds Cafe Scientifique, Leeds, 1st May 2012. Download Abstract. Stride, C.B. 'Modelling Stadium Statue Subject Choice in US Baseball and English Football'. Invited talk to Leeds/Bradford Royal Statistical Society Local Group (GetStats Event), Thoresby Room, Leeds City Museum, Leeds, 24th April 2012. Thomas, F. E. and Stride C. B. 'How to Get From Pitch To Plinth: Modelling Statue Subject Choice In US Baseball And English Soccer'. NESSIS 2011. Harvard, 26th September 2011*. Download Poster. Stride, C. B., Wilson, J. and Thomas, F. E. 'From pitch to plinth; a study of the UK’s football statues'. British Society of Sports History Annual Conference. London, 2nd September 2011. Download Slides. Stride, C. B., Wilson, J. and Thomas, F. E. 'From pitch to plinth; a study of the UK’s football statues'. Theorising the Popular. Liverpool, 26th July 2011. * Winner of NESSIS 2011 Poster Prize.